« *** WINNERS *** Tina, Linda and Melissa are Living the Life of Riley! CONGRATULATIONS! Now that the cold winter weather is here to stay for the next few months, your children may find some extra time on their hands, since going outside to play isn't quite an option any longer. This is a great time to bring them in for fun, family game time, indoors! Haywire Group has so many interesting and unique family games to choose from and I had the opportunity to review two of their biggest sellers: Flickin' Chicken and DICEcapades! Number Ninjas. Keep reading to find out about two games which just might lift you and your family out of the winter doldrums. DICEcapades! Number Ninjas, which retails for $24.95. Flickin' Chicken, which retails for $19.99, but is currently on sale for $15.82 with FREE SHIPPING. First up, was DICEcapades! Number Ninjas, a math-based game geared for children ages 7 and up. 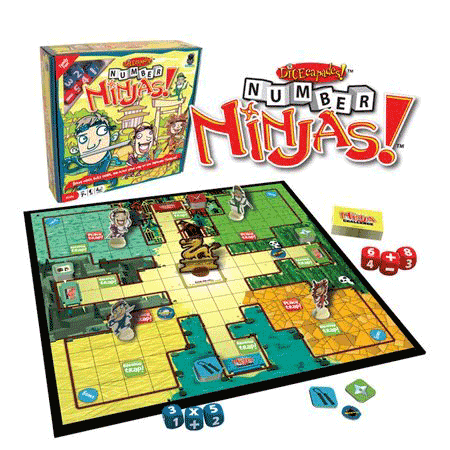 The object of this game is to be the first Ninja to get all four Quest Items by successfully completing four Ninja Challenges in the four different areas of the game board. Once all four Quest Items have been earned, race to the Golden Dragon to win the game! One of my favorite features about this game is how there are two different levels of play, depending on your math skills. Before playing, everyone should decide whether they are a Ninja Recruit or a Ninja Master, so that they will know which set of problems they will be expected to answer. This game is wonderful for sharpening those math skills, because math is infused into every aspect of this game. Even the dice you roll on every turn is a math problem, for you must add, subtract or multiply the dice to determine how many spaces to move your Ninja on the board. There are special spaces on the game board which allow for the placing and removing of Traps and for the completing of Ninja Challenges. The rules are very simple and easy to follow and the game itself is a lot of fun. Since Riley isn't old enough to play the DICEcapades! Number Ninjas yet, my husband and I decided to give it a go and we had a lot of fun in the process. I loved how our math skills were really put to the test in an enjoyable and entertaining manner. 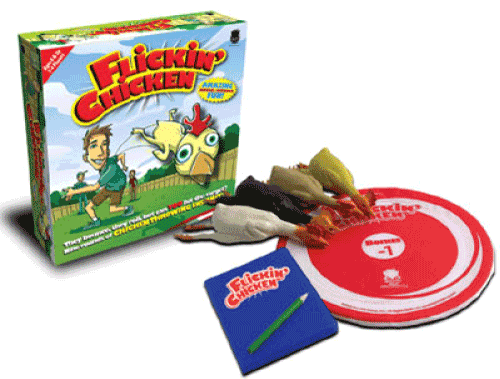 Now Flickin' Chicken is a game much easier to explain, for the rules are very simple and easy to follow. The object here is to fling the red and white target disc in the same manner that you would a Frisbee, paying close attention to which side lands face up. This is important to note, for one side has a bonus spot and the other side a penalty spot, which adds a bit of strategy. Next, take turns throwing your specific chicken at the target disc. Each throw you make counts as one point and you have to keep throwing your chicken until any part of it lands on the target. Scoring is kept in much the same way as golf, with the lowest score after nine rounds being declared the winner. Now, you might think that Flickin' Chicken is only to be played outdoors, but that isn't entirely true. Because these chickens are lightweight and composed of a rubbery plastic, you can actually play this game indoors as well. I would just recommend finding an area of your house without any breakables, such as an entryway or playroom. You'll be laughing and carrying on before you know it! Disclosure: I received Flickin' Chicken and DICEcapades! Number Ninjas from Haywire Group, Inc. in order to facilitate my review. No other compensation was received. This product review is based on my own personal experiences with this item and is completely honest and objective.